I believe that we are all creators. I thing that sometimes our “Creative Power” gets turned off for a number of reasons. My goal is to help others find that power of creation through play. Check out this short video to see what can happen when chocolate pudding and orchids inspire you. Recently I found a muse in stories shared about orchids. It all started with my own orchid story. My friend Stephanie was diagnosed with stage 4 cancer. This news broke my heart. I needed to do more than pray and send my love. I wanted to give some hope. As I pondered over what else I could do, orchids came to mind. I went to a friend’s orchid farm and found a very delicate, small orchid that had multiple spikes of buds patiently waiting to bloom. I wanted this orchid to be there for Stephanie as she went through the rounds of chemo, blooming slowly over a long period of time to give hope with each new bloom. Going to the orchid farm and giving the orchid to Stephanie inspired me to paint. My goal was to capture the hope and joy that had come from the gift of the orchid. The idea came to paint orchid portraits. I photographed 45 individual orchid plants, documenting the name, bloom size, height, and width. Then I started to paint with Stephanie in my heart. As I thought about my own experience, I wondered if there were more orchid stories out there. I reached out to my family and friends and asked if they had any orchid stories to share. Beautiful stories came rolling in and filled me as I went to the studio. I was not just painting orchids. I was painting love. The love keeps growing as more stories started pouring in. Do you have an orchid story? I'd love to hear it. Click the "Submit a Story" tab above to submit your story at www.orchidstories.com . Mark and Ginger have this amazing getaway in Breckenridge, Colorado. They love hiking and nature and asked me to paint a commission that would incorporate something I have never done before. Paint a diptych (two panels) of the Holy Cross Mountain in Colorado with spring on the left panel and fall on the right panel. I was excited to jump in and create! Raitman Galleries in Breckenridge, CO helped Mark and Ginger map out the size for the two panels using blue painter tape, the contract was written up, and I began to paint. It was a thrill to see the painting take shape and tp watch this really amazing story come alive! 1-Add some yellow Aster to the spring portion of the painting. 2-Move the very distinct Holy Cross Mountain onto the Spring portion of the panting to symbolize the rebirth and renewal that has such spiritual meaning for them. I explained that the Asters were a very simple thing but moving the mountain was not an option at this point of the process. I also explained that I had purposely placed the Holy Cross Mountain on the autumn side for the simple fact that as we move into the fall and winter those are the times that we need to have the promised hope that spring will come again. In my own life, I have gone through seasons of winter/hardship. As that hardship starts to lift there are signs of rebirth everywhere. I love that hope that parallels knowing and trusting that spring will come again. Mark and Ginger loved the idea of the Holy Cross Mountain remaining in "Fall" but asked if I could, along with asters, add a butterfly to symbolize one more sign of rebirth. I was thrilled!!! We were set. All this happened on Friday and an appointment to deliver the completed commission to their home with Brian, from Raitman Galleries, was scheduled for Monday. This gave me time to make the changes. I woke up the next morning excited for my Saturday and checked the weather forecast. Winter storm warnings were being announced for MONDAY! I was so disappointed and stressed due to the fact that I prefer to not travel in a winter storm. Then inspiration struck. I reached out to Brian to see if we could possibly hang the painting that very day. We made some tentative plans and then Brian reached out to Mark and Ginger to see if we could come up that very day. Mark and Ginger were out hiking, but around 3:00, I got the go ahead to come on up. With being pinched on time, we all decided that the butterfly and asters would be added at Mark and Ginger's home. Brian and I arrived with the commission and we set up a little painting place on Mark and Ginger's kitchen counter. We had a blast sharing stories, looking at reference photos and painting. It was a joy to watch it all come together and to see how happy Mark and Ginger were with their new painting that I titled, "Promised Hope". "Sweet Dreams" - Thank you for the kind words, Sharon and Dennis. Well, I am just totally embarrassed to have waited so long to tell you how much we love, love, love "Sweet Dreams!" My husband was right; I should have sent you a short message within a few days, but, noooooo, I wanted to say much more because everything was perfect and deserved mention. Sincere apologies to you for my procrastination and on top of that I rewrite which takes even more time - old English teacher. As my husband ripped opened your box and took out the sections, we were impressed with your packing - bet you have done that a time or two. :) And then - "Oh, look, she wrote on the back!" Your words spoke to us: My husband was career Navy with months spent on Aircraft Carriers away from home. Adventures in life, whether as a family or individual, are wonderful, but relaxing together in our own house, being able to rest in comfort are very important with those "Sweet Dreams" of times past, and future hopes for our family. Thank you for the Writing "extra bonus" on the center piece. We sure enjoyed that surprise and it was fun to slowly unwind the clear wrapping. We do feel peace every time we walk through the double doors into our room; your "beautifully imperfect" trio take us into a forest filled with colors we love. Our company (son and girl friend) thought it was beautiful as well - for its uniqueness and impact - they were "wowed." Then we played your video, so they could appreciate all the steps toward the grand finale. We thank you again for putting that together - it is an amazing process you have. Our granddaughters, who live a few blocks away, liked the shiny foil and were also fascinated by your video. Then to observe the overall finished art was another treat. It helped them to understand how much time and effort goes into creating your work. And Yes, they touched your paintings!! :) :) And, yes, they were amazed we let them. Your "Sweet Dreams" lifts us up and brings on the smiles, so Thank You again for creating such lovely work for our humble wall. 2009 - My van was loaded with art and I was headed to Sedona, AZ for a gallery adventure. With it being early October, the leaves were peak near Telluride, CO, so I decided to follow the color and go the long way. Just past Ridgeway, CO, I noticed the sign, Last Dollar Road. I had heard about this epic drive years ago and couldn’t resist. I turned onto the gravel road a bit stressed wondering if I could make it in my Sprinter van. I quickly realized it was worth the risk to have the experience of a lifetime. It became apparent why this rout to Telluride was talked about with so much reverence. I drove slowly with the windows down, stopping constantly to take photos. I was smitten. My heart did something that surprised me. I wanted to stop right there on the side of the mountain and stay in my van and paint for a month to capture all the color. It’s like nothing else existed in that moment but this land and me. I told myself, “You will get this dream later”. My trip to Sedona was a success and I was back in the studio haunted by what I felt on Last Dollar Road. I was compelled to paint all the layers of color and Mountain Love was born. 2017 – Raitman Fine Art Galleries informed me that a new commission was coming my way. Mike and Maureen from Texas wanted a revisit of Mountain Love in a 60” high x 48” wide, single panel. There I was, after all these years, in October and painting Last Dollar Road. Instantly it was like I was on that gravel road. All that color flooded back into me and painting was a sheer joy. In fact, I got carried away and before I knew it I had forgotten all about “Mountain Love” and I was bopping along to a whole new beat. I got the colors spot on but I missed the mark on the foreground. I painted the fence posts too big and neglected a few other key details. I sent the approval photo off and was bummed when I realized how far I had strayed. The collectors were open to FaceTiming with me to talk through the painting so that I could make a few changes to get it closer to the inspiration painting. Our FaceTime appointment went great! I got to see their gorgeous home and saw the place where my painting would hang. We talked about getting the fence posts smaller and making a few other simple changes. The next day at the studio when we FaceTimed again, Mike and Maureen were thrilled with the changes. However, there was one more area that we worked on together to make sure that the colors were spot on. It was like Mike and Maureen were right there in my studio working with me. I love FaceTime! We were able to connect in real time without me needing to go all the way to Texas. All approved and ready to ship, I titled this new painting “Our Mountain Love”. It truly is a shared love. I have not forgotten my dream. I will go back to Last Dollar Road and spend a month on that mountain. I notice the cutest curly headed girl in the arms her mother. The little girl becomes very animated and in a flash she is on the ground squealing and running right into the arms of a little boy. I witness sheer bliss and love in the embrace. Their love, excitement and SMILES were contagious and I was infected with a smile. Doug and Dana are getting ready to live an adventure on a boat for a year or two. Everything is going into a climate controlled storage unit but Doug was worried about making sure that "Red Beauty" would be safe. He reached out to me via my website through the "What's On Your Mind" form. I gave Doug a call and we walked thought the best way to store their painting. It was so exciting to hear about their upcoming adventure. I love seeing people living out their dreams. Bravo! Wrap each panel in a moving blanket. Shrink wrap the outside of the blanket to keep blankets secure on the panels. Place the painting completely upright against the wall of the storage unit. I would place some foam or wood block under the panels to elevate the art off the floor incase of any potential water damage in the unit. You never know. The key to make sure that nothing is leaning on the art that would cause warping. Happy travels to Doug and Dana. I know what you are thinking, GROSS!!! Yes it is. There is something magical that occurs when I get into a state of "flow" in the studio. The whole world slips away from me and it's just me and my painting. When I'm in this deep state of the creation process, I forget that I have a body. Time slips away. I forget to eat. It's generally at the moment after a long, intense painting session that I realize that my body is crashing. That's why I keep cans of tuna in my studio. I love how the body lets us know what it needs. When I first started turning to tuna to help pull me out of the crash, I would take the time to drain the juice from the can. I remember the first time I was so desperate to balance out my body. I thought, "Man, that tuna juice looks good!" So I drank it, and WOW!!!! Instantly felt better. I'm to the point now that I actually crave the stuff. What does your Tuna Juice "fix" look like????? I spent 6 hours in front of Elliott Yeary Gallery in Aspen Colorado this summer painting on the busy pedestrian mall. The day was magnificent. Perfect weather in this gorgeous mountain town. The same thing happened over and over. A small child would run up and get so excited about what I was doing and reach out to touch the painting. The freaked out parent would desperately try to stop the child telling them to not touch. You can imagine what is going thought the parents head. I have felt that same way with my own children. This is the moment were I get to give a great gift. The permission to touch. I explain that I love touching everything. I wanted to create art that could be touched and loved. I believe touching is loving. As I gave permission over and over again to touch my paintings and talked about how touching is loving my world expanded. Bella Rotta is the name I gave my art artform. It is Italian for "Beautiful Broken." The element of imperfection in my work is intentional. I believe that imperfection is the source of all great beauty... it's why I break my paintings. The cracks are real. You are encouraged to touch and feel all the texture of the paintings. Growing up on a dairy farm working with animals and earth, growing crops and building fence, learning to nurture life and respect nature. This is were my life as an artist began. The lessons of balance and harmony learned on the farm where invaluable in expressing my feelings and experiences on canvas. Some of my subject matter comes from early childhood experiences on the farm, but still more comes from my life with my children. Seeing the world simplified through their eyes has given me great inspiration. My paintings are more of an essence of nature, not a literal representation of it. It’s the emotion that a stand of aspen stirs inside me that is captured. You will notice lots of familial references in the titles of my paintings like “Three Sisters,” “Protecting the Little One,” and “Family of Five;” this is no accident. Family is very important. My family also led me to another love, Italy. The first time my husband and I traveled there, was an immediate connection to art and my heritage. Undeniably, this was home. Rich colors and wonderful history overtook me as I absorbed the culture. Experiencing Italy with Italians awakened the artist in me. 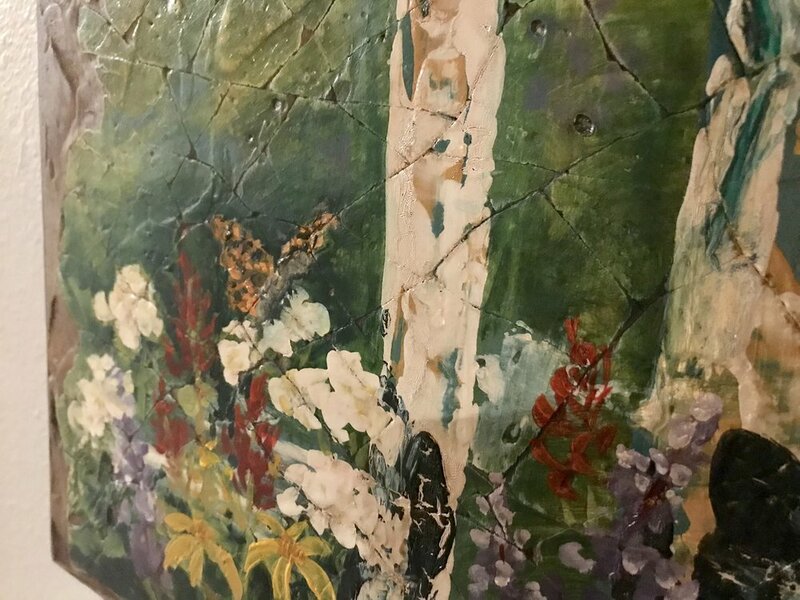 There is a sense of history with my paintings, helping viewers to experience the same enchantment felt, when coming upon a worn and broken, but beautiful old wall. We are all creators. This fact is what makes us divine. As children, the creative process is alive in us. We have no fear as we create. We are just doing what comes naturally. We create. We play. We daydream. As we grow, if we don’t take great care, this innate quality gets tarnished and squashed until it is snuffed out completely. I love connecting with “You” at an emotional level through my art. Art is meant to be shared. It is meant to stir emotions in you. There is an exchange of energy when you connect with a creation. I paint and create to connect with you. What do you feel when you see and touch my creations? Do you feel that same magic that I felt in the studio as I created this moment for us to share? I know this narrative intimately. Twenty years ago, I was lost in the adult world so deeply that I was almost completely gone. It was in this dark time that I found hope, light and the healing power of creation that had been so alive in me as a child. My healing started with little paper mache figures and grew into wooden structures. Power tools restored my own power. The more sawdust I created, the more paint I used, the healthier I became. The gallon pails of cheap house paint were replaced by fine art oil paints when a dear friend shared an afternoon of play with me. I will never forget the wholeness I felt mixing those fine art oil paints for the first time. On that day, I knew I had found the missing part of my soul. It was a magical moment. I see now the beauty of being broken, completely broken, for it allowed me to again find that divine creator in me. Bella Rotta - Beautiful Broken, was born out of my own brokenness. My studio is a very sacred place. This is where all my worries and troubles leave and I am filled with deep internal peace. I believe one reason for this is due to the very physical nature of the ten-step Bella Rotta process. It requires me to be completely present; body, mind and soul. I leave this harsh chaotic world and step into MY world of harmony with the play of color, texture and composition. The Bella Rotta process heals me inside and out day after day. I am so thankful for the opportunity to share Bella Rotta with you. Creating The Video: How I got my name, "Rolinda." So many times when I introduce myself to people, they ask about my name. I felt it was time to tell the story about my name and how my name has has influenced my journey in the art world. Michele, was a huge help in refining the script and in filming me while in Aspen. Kelly and Kristin, at Elliott Yeary Gallery, for the beautiful setting. Kathy, for all the cheering and editing. Iain, at Blues Eyes and a Hat, for teaching me how to make a video and giving me such great ideas . My Mom and Sister and kids for all the great photos. My husband, Ammon, for being my biggest cheerleader of all. I have a video of the birth of my 19-year old daughter that I have never watched. Truthfully, I am a chicken. I just can't watch it. I'm so glad I gave birth to my beautiful daughter, but, even after 18 years, I am still not ready to be an observer of that moment. What does this have to do with my art? I have been filming time lapse videos of the "birth" of my paintings. The first few videos filmed were so hard for me to shot and even watch. I felt shy and nervous. By the third and forth filming I could not get enough! It is not about seeing me painting. It's about witnessing the creative process. It feels so exciting to become the viewer. When the painting session is completed, I climb the ladder to stop the filming and collapse with exhaustion. I can't wait to then hit the play button. Oh what incredible satisfaction and joy. Not of what I just did, but of watching the birth of this new creation condensed into seconds. So, now I must rethink this birth video of my daughter. If I watch it on fast forward, could I have that same thrill? Birth of Winter 48" x 70"
How do you like your eggs? I love going to breakfast with a new friend just to find out how they like their eggs. Now the better question. How do you like to spend your vacation time? So friends...How do you like your eggs/vacation? This is the story of my creation of Autumn Rush, a plein air painting in Ashcroft, Colorado September 2015. You never know where my Sprinter Van will take me next to paint. Let me know where you think I should paint next. It is so fun to share this experience with you. Feel The Flow 48"x36" There are times that feel flawless - everthing flowing, connecting into the perfect now. There are “rules” about wearing stripes. I have learned that there are “rules” about painting stripes as well. We Spend so much time doing and going that life can become a blur. Escaping to the mountains changes time somehow, making it sacred time spent. "Our Mountain Time" captures that escape. Check out My new Brochure that has just arrived at all my Galleries. Stop in and ask for your own new Brochure.